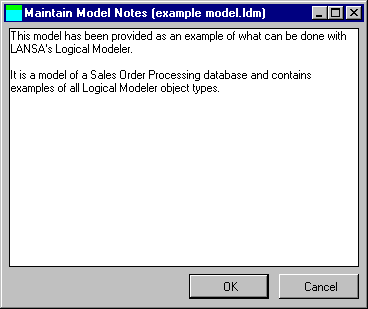 The notes facility for models is merely a documentation tool for use when constructing a data model. Unlike element notes, which are transformed into field help text when the element is built, model notes are not carried through from the model to the repository. ensure that no diagram objects are selected and click the button on the toolbar. The standard LANSA special help text characters may be used in the notes. For example, you can display help text underlined, highlighted and so on.